My plates and serving pieces are lead-free, dishwasher-safe and safe with food. 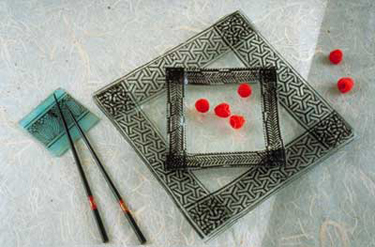 Keep a few small plates on hand for hostess gifts to use for chocolates, tea bags, soaps, candles, jewelry, sushi. The platters make excellent wedding gifts and are ideal for anyone who cooks and entertains. Colors, sizes and shapes may be made to order. Platter price range $75- $150. Contact me for current pricing and availability.